Enjoy this season with handmade accessories - bracelet or anklet - whatever you want. Lovely and beautiful they can be made in many colors to fit your mood and style. 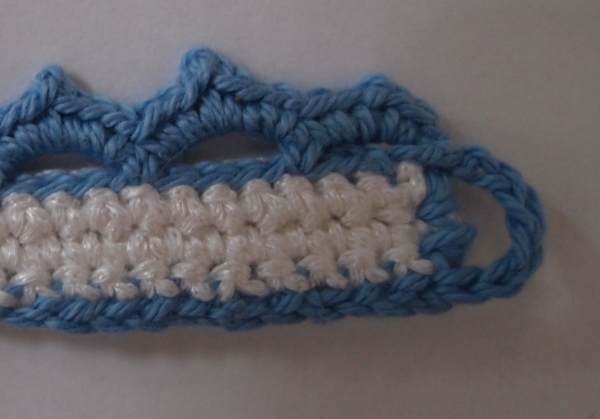 This is a very easy and fast project that uses only basic stitches and can be made even from beginners in crocheting. Ch 43 (multiple of 4 + 3) with color A, join color B and sc in second ch from hook, sc till the end (42 st). Turn. Check whether the bracelet/anklet size will fit, if needed add/remove chains (just make sure the starting chain is multiple of 4 +3). Ch 1, sc in same st, sc till end. Turn. Repeat this row one more time. Now change to color A - ss in each st till end. Turn. With color A *ch4, skip 3st, ss in the 4th st*, repeat * - * till the end. Turn. In each chain space work *3sc, ch2, 3sc, ss in next chain*, on the last chain space ss in last stitch of the row. Turn the piece and work sc on the narrow side. Cut the yarn and weave in the ends. Now on the opposite side - join color A and work a row of sc (3-4sc). Turn. Now chain 5 or 6 (depending on the button size) and ss on the opposite side to form a button hole.